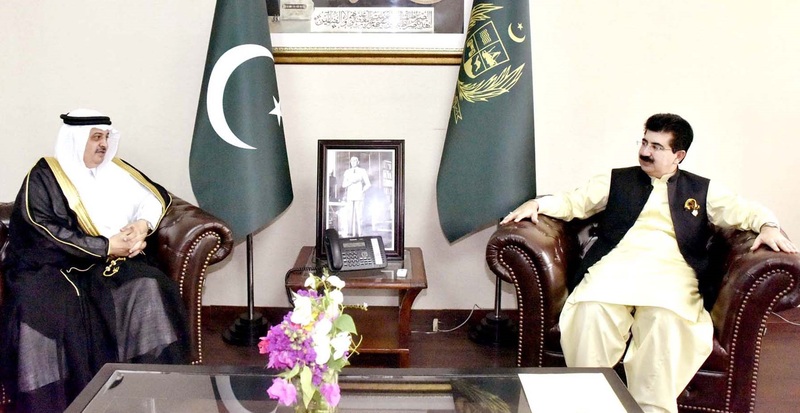 ISLAMABAD: Saudi Ambassador to Pakistan Nawaf Bin Said Al-Malki on Tuesday met Senate Chairman Sadiq Sanjrani reiterated and the need to further strengthen the existing bilateral relations between Pakistan and Saudi Arabia through enhancing cooperation in various areas of mutual interest. Senate chairman observed that Pakistan and Saudi Arabia have traditional and historical linkages with one another and mutually share a time-tested bond of friendship. He also underscored the need for enhanced economic linkages between two sides. Senate chairman said that Pakistan and Saudi Arabia share common traditions, religious values and social aspirations and have supported each other not only on International issues but in the development agenda. He said that a large number of Pakistanis are contributing to the development of Saudi Arabia while Saudi Arabia is supporting Pakistan for pursuing economic development and social uplifting initiatives. He said that there is a need to exploit the tremendous potential for economic cooperation between the two countries. He said that enhancing people to people contacts would steer the agenda to enhance bilateral ties and economic relationship. He said that Saudi Arabia can benefit from the improving security situation in Pakistan and invest in different sectors to boost the trade and economic ties. Speaking on this occasion Saudi ambassador said that his country is trying to facilitate the Pakistani workers and pilgrims. He said that the Saudi government is considering to increase the Hajj quota for Pakistan from next year.